Bill Gordon of Stamford grabs a shot of this Austin Healey at the Caffeine & Carburetors car show event downtown on Sunday, Sept. 16, 2018, in New Canaan, Conn.
NEW CANAAN — This mammoth collection of sports cars and the like shows no sign of slowing down. Sunday morning saw another Caffeine & Carburetors event on and around Elm and Pine Streets, with hundreds of special vehicles proudly displayed by owners and thousands of spectators circulating. “For three hours this is the most expensive street in the world,” noted longtime volunteer Matthew Konspore of New Canaan, given the quality and price tag of these myriad classics. He and others also noted the great value to the community at large, with families coming out from the region to see the open-air museum-like collection. 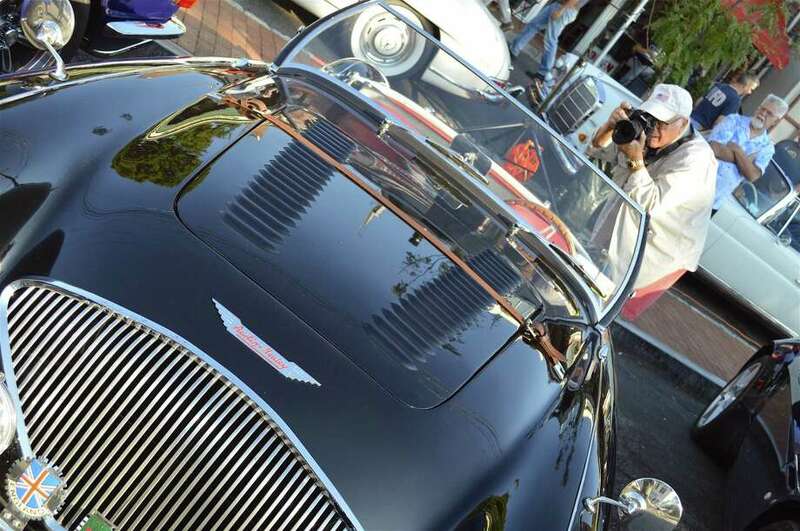 The next Caffeine & Carburetors event is scheduled downtown on Oct. 21.